Journey north across the Golden Gate into Napa and Sonoma Valley for a wine tasting tour in the California Wine Country. Your 9-hour itinerary from San Francisco includes exclusive estate tours of three popular wineries: Madonna Estate, Sutter Home, and Sebastiani Vineyards. Stop to purchase lunch in the Sonoma Plaza, where you'll find a bevy of dining options and boutique shops. Lunch option available. After a morning pickup from your San Francisco hotel, you'll depart Fisherman’s Wharf by luxury coach. Journey to the Northern California wine country of Napa and Sonoma Valley, crossing over the Golden Gate Bridge. Your first stop is the Madonna Estate, located in the world-renowned Carneros region. On a guided tour, learn about the Bartolucci family’s success combining traditional and modern wine-making techniques with their organically grown grapes and estate bottled wines. Taste more wines at the Sutter Home Winery, established by the Trinchero family in 1948. 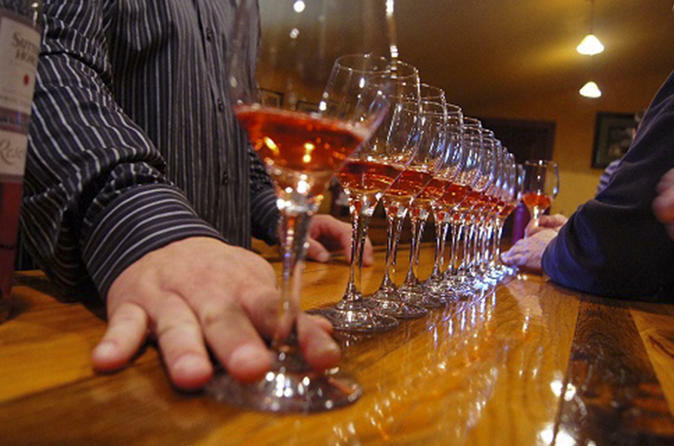 Discover the flavor profile of white zinfandel and other high-quality varietals during a tour of the second largest independent family-run winery in the US. Break for lunch at the historic Sonoma Plaza where you can purchase lunch and have leisure time to explore. There, you will find a variety of eclectic dining options and one-of-a-kind boutique shops and art galleries. Save time on finding a restaurant during your lunch break. You have the option to book this day trip to include lunch with a stop at a local favorite right in the heart of the historic Square in Downtown Sonoma. Enjoy items from a variety of Californian-inspired dishes ranging from sandwiches, pastas and seafood. An appetizer, entree, beverage, tax and gratuities are included. With more than a century of wine-making experience in Sonoma, Sebastiani Vineyards and Winery focuses on crafting small lots of super-premium wines. Discover the appellations of Sonoma County while you sip Foley family wines crafted under the guidance of its vintner. One the way back to San Francisco, relax during another scenic drive over the Golden Gate Bridge, with drop-off at your hotel. Winery schedule and venues are subject to change based on private events.